This is a book review submitted by my friend Dennis Gravey from Portland. It is especially timely considering that the group Social Equality Educators in Seattle is currently running a slate of candidates for office in the Seattle Education Association, our local teachers’ union. As far as I can tell, they are inspired by the strategy pursued by CORE in Chicago. Gravey assesses the strengths and weaknesses of that strategy. I have some disagreements with his assessments and am skeptical of focusing on building union caucuses, as I had laid out here. If I have time I’ll write a response to Gravey and Uetricht and post it on this blog. 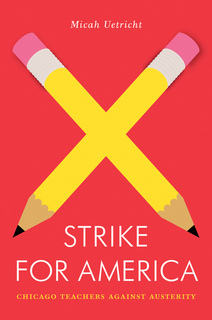 Micah Uetricht’s new book on the Chicago Teachers Union and their historic 2012 strike, Strike for America, out from Verso Press with a Jacobin Press imprint, offers a useful and intelligent reflection on an event that has become a cornerstone of labor activists’ sense of recent history. It offers a number of useful analyses and accounts, and will hopefully become a tool both for activists within education and the left movement more broadly. In addition, it poses some interesting and current theoretical and strategic questions that help us think through some of the toughest intellectual tasks of our time. The book is organized around two essays first about the rise of CORE (the Caucus of Rank and File Educators), of which the CTU strike leadership were members, and one on the strike itself. These two are then followed by an extended reflection on the future, both of the CTU and the labor movement more broadly. On the rise and model of CORE the book offers a number of thoughts about strategies for rank and file renewal of existing unions and in particular the role of radicals in that project including strategies both once in leadership and for gaining power. Uetricht counterposes two models for an organized radical force, boring-from-within, where radical elements attempt to influence existing leadership (pg. 30) and seizing control, where an organized faction takes power and makes unified decisions. Uetricht account of CORE’s model describes a subtly different path of an organization whose members assumed leadership, but maintained an autonomous ideological and organizational pole not only where strategy can be developed, but where dissent and education can take place. He explains that, “the caucus brought an insurgent leadership into power, but has acted independently of it” (pg. 42). This allowed the caucus to hold its leadership accountable, remain rooted in the rank and file, and become a pole for dissident rank-and-filers to gather organically and develop their insurgent potential. Without taking power, this pole would have been drastically less impactful, but without its independence and flexibility it is unlikely the result would have been as dynamic and exciting. Uetricht acknowledges this model is not new, and is very similar to many experiments in rank-and-file organizing by American Left organizations in the 1970s, but it is an inspiring idea as more members of the activist left become engaged in workplace centered political work (the current IWW being a prime example of this). The rewards in this case are obvious, but the challenge will be figuring out how to continue the work of building a left pole outside of specific, if significant, institutions. Beyond the basic terms of strategy, CORE also offers an interesting example of a path to power. Rather than forming explicitly as rank-and-filers, and basing their organizing around the bread and butter interests of union membership, they formed around the more diffuse struggle regarding public education in Chicago. 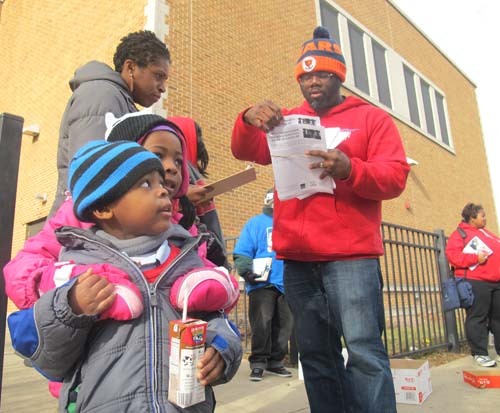 The roots of CORE lie not in previous union reform efforts, but in the struggle around school closings where leaders like Jackson Potter and Jesse Sharkey became recognized a leaders of a struggle largely driven by parents and students. Their identities as teachers was strategically useful in this context, but was not the main driving force for their involvement. Uetricht’s description shows an organization that initially had more focus on broader issues and ideological development, like reading Shock Doctrine together, and only subsequently moved to take union leadership after it became clear this was the only way to further the struggle for public education. Discourse around union democracy and the political struggle in unions often centers on whether or not leadership serves the rank-and-files interests as workers, and imagines the project of union renewal as a project of forming better unions. CORE poses a serious challenge to this model in that it demonstrates that union renewal can, and maybe can only happen through a broader activation of workers’ sentiments for a better world and by forming organizations around ideological affinity, uniting around political vision and critiques, rather than bread-and-butter economism, i.e. following narrowly defined lines of economic interests as the foundation of union building. Of course there’s an argument to be made that teachers are more open to these more abstract forms than other workers, but there’s also an argument that economistic mobilizations actually tail more class-wide projects. Indeed history casts severe doubt on the idea that one moves linearly from concrete, practical economic demands like wages to the more abstract, lofty demands for a radically transformed world. We have to start seeing a more dynamic relationship between utopian dreaming, explicitly revolutionary activity, and the everyday bread and butter concerns that structure so much social tension and struggle, and this is what Uetricht’s account helps us do. The idea that the project of reviving unions is centered outside the bread and butter, is deepened by Uetricht’s account of the strike itself and particularly the everyday solidarity present throughout Chicago during the strike. Not only did polls consistently show strong support for the teachers, Uetricht includes personal accounts that are difficult to fathom, receiving a free pastry and words of support from non-union baristas and even a free bus ride, all for merely wearing his union t-shirt. He implies that the real meaning of the CTU strike was not the struggle of workers against their employers, or even material effects of effective industrial action, but the work that the strike did on the class consciousness and collective sense of workers in Chicago. Building off of CORE’s more ideological roots, the strike did more than create an effective union, it created an effective example of class struggle and helped build a sense of solidarity throughout the city and even activate sectors of the class seemingly far from their rank-and-file membership (though one of the unique aspects of public teachers are their embeddedness in the lives of working class families). Today it’s rare to see a union strategy so explicitly aimed at developing class consciousness and changing the collective sense of workers. Even more rare is this strategy being paired with effective, well organized, and dramatic action rather than the abortive or weak efforts at fomenting mass struggle like SEIU’s fast food organizing, UFCW’s Our Walmart campaign, or numerous IWW efforts. Uetricht highlights that the overall result of this process was a destabilization of the ruling coalition of the Democratic Party. This offers an important question for Lefitsts: what is the relationship between this coalition and our revolutionary project? In some ways this is a fancy way of asking how relevant electoral politics are, but I want to highlight the lesson that Uetricht gestures at, which is that substance of this coalition is not which organizations do what and who gets in office, but how these movements affect the ideas, sentiments and activity of masses of people. The problem for the Democratic coalition posed by the CTU is not that it loses a funding source, which can easily be made up for from Wall Street, but that it loses the legitimacy among Chicagoans and poses a serious challenge to the possibility of an Emmanuel machine. The question is, what do we do with that lost legitimacy, do we run candidates, or do we build alternative power, and if we do run and win candidates, what will they be capable of? Uetricht cites the Teamster rebellion of 1934 in Minneapolis, which was helped along by the relatively sympathetic Farm Labor Party regime in Minnesota, but it was ultimately not those elected officials, but the strikers in the street that made one of the most important events of the American working class struggle. Uetricht interlaces this account of union strategy with political and historical framing of the efforts to dismantle public education in Chicago. He identifies a “neoliberal” project of “privatizing” or “corporatizing” public education, through charters, philanthropic investment, school closing, and most centrally to the CTU, the attempts to break the teachers union. These strategies are in place throughout the country and have a great deal of unified coordination nationally through DC policy makers, ideologues, and monied foundations. The materialist core the analysis seems to be that Capital is using the financial crisis of 2008 to motivate a cycle of primitive accumulation over the public sector and use privatization of public enterprises as a new source of profit. This analysis seems plausible, but I think falls short, just as the idea of the Prison-Industrial-Complex as a source of cheap labor fails to understand the real dynamics of social control as well as numerically not being substantiated (See the work by Loic Wacquant for a more developed account of this). It’s unclear if the potential profits garnered through this strategy are a viable way out of the accumulation crisis faced by Capital, and what’s more it tends to falls into a false narrative that counterposes privately held capital as “capitalist” and publicly held enterprises are more “socialist,” and ones that therefore might work to undermine capitalist hegemony. More than seeking profit, Leftists must ask why Capital sees it as advantageous to restructure public education when the system in place over the last three decades has been roughly successful at maintaining mass docility and a relatively easily exploitable labor supply. Austerity likely has more to do with shifting strategies of white supremacy, so called “surplus populations,” which are no longer useful to capital accumulations as either workers or consumers, and changing needs of the labor market due to automation than with a direct effort by Capital to use a formerly public sector as new grounds for profits. As a final thought I want to discuss one of Uetricht’s boldest claims, that the CTU strike was a qualitative leap forward from previous movements like Occupy and the occupation of the Wisconsin State Capitol building. He writes that, “it was the CTU strike that first identified that rising tide in the form of an angry union membership and channeled it into an effective, militant political form, winning real gains and building power both for education workers and the communities they serve” (12). This will likely ruffle some feathers and I have sympathy with both the claim and the ruffle. I think it’s an idea that must be handled with care. There’s a danger in thinking that the ultimate success of a cycle of struggle lies in the way it transforms the leadership and activity of specific institutions, and Uetricht comes dangerously close to implying that the upsurges of 2011 are significant only insofar as they impact the halls of power. In contrast to this, the reading I’m trying to pull out from this book, albeit a bit against the grain, is that the ultimate arbiter of the significance of both the less coherently organized formations in 2011, and the more coherently organized CTU strike, is the relationship they have to the broader and more diffuse sentiments, ideas and activity of masses of people throughout society, within and without protest movements or the specific organizations. What matters is not the specific organized acts but the way these acts reconfigure the balance of social forces through changing the apparently unorganized activity of millions of people. In this light the CTU strike offers and important lesson on the relationship between spontaneity and organization. The debate is not: organization good v. spontaneity good; or: material impact more important v. material impact less important. Rather, it must be about how specific forms of organization express and transform the activity of millions of people in such a way that it advances a revolutionary process. What’s important about the CTU strike is not that it made more material headway in combatting neoliberalism, and could have only done so by being an organized, institutional force. But rather, that as an organized, institutional force that was able to make material headway against neoliberalism, it had unique power and potential to transform mass activity outside of institutions and specific organizational wills, activity that in a conventional sense appears as unorganized. This dynamic played itself out again in Portland where the potential (though unactualized) teachers strike allowed the students and other sectors of the activist left to become activated in ways they were apparently incapable of doing outside the context of the organized institutional movement of the teachers. Many leftists are rightfully skeptical of the radical potential of the existing institutions, but then throw the baby out with the bathwater when they use this as an reason to refuse to actively engage in shaping the activity of these institutions. While their ultimate potential is highly limited, their actions may open many unique opportunities for things to appear, even if sideways and behind the back of their movement. The Unions, non-profits, and the like will be the first to be left behind by the masses, but this leaving behind might only be possible after these institutions themselves move. In this context CORE’s independence from the union leadership is a powerful positive example, and the last minute deal calling off the Portland strike is a powerful negative one. At this point is should be clear what the true test is of Uetricht’s book: How will it relate to the broader sentiments, ideas and actions of thousands (maybe indirectly millions) and help develop the left as a pole within society. In the week leading up to the potential Portland teachers strike I saw my roommate, a young teacher relatively new to politics read Uetricht’s book with relish and become more engaged afterwards, the husband of a striking teacher mention CLASS Action (another Jacobin project Uetricht also contributed to) at a solidarity campaign meeting, and teachers, parents and students discuss how the dynamics playing out in Portland are part of a national attack on public education. All of these are small, but bode well for the daunting project of rebuilding a left in the U.S. that is mass, popular and actually capable of ending capitalism. This book is a small tool in that project, and hopefully folks can figure out how to use it.